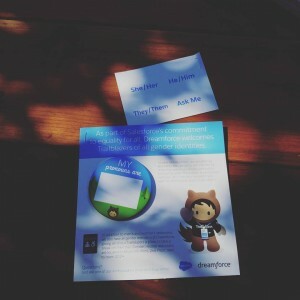 As an Operations Assistant at Bellwether, I had the privilege of being one of three Bellwarians to attend Dreamforce ‘16, Salesforce.com’s annual 4-day user conference in San Francisco. At Bellwether, we use Salesforce as our primary data and client management system, and I was looking forward to learning more about what Salesforce has to offer to take our operations to the next level. This was my first time attending, and I had been looking forward to it for months. I spent hours poring over the schedule and the 500+ sessions per day, trying to strategize which ones I (and, as an extension, Bellwether) would get the most value out of. I mentally prepared to be overwhelmed by the crowd of more than 100,000 attendees descending upon this small section of San Francisco. The last thing I ever expected to think about was my gender identity and how it would play out at the conference. Photo by author. Click to expand. 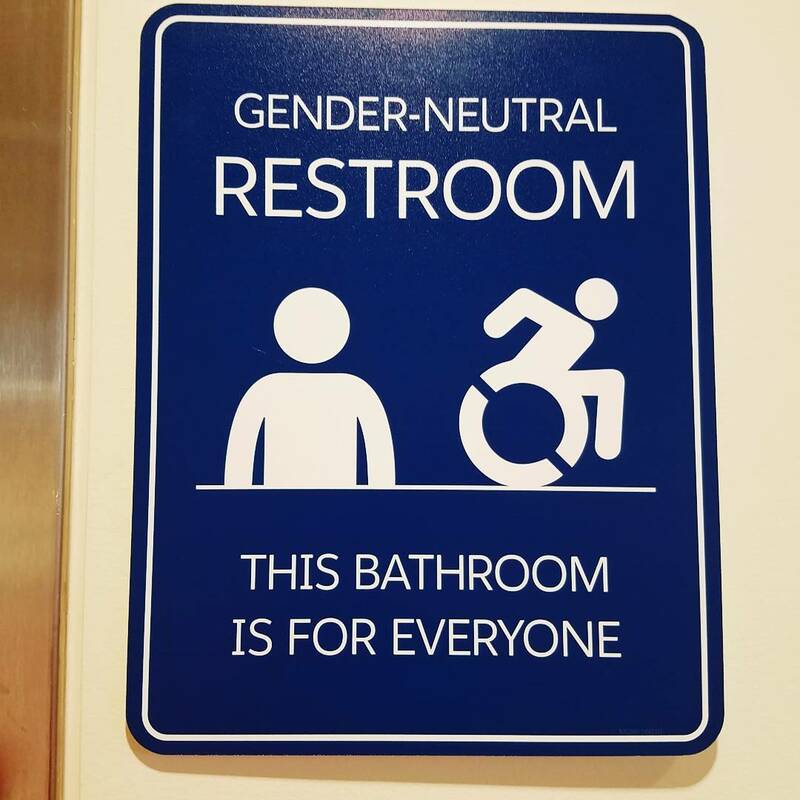 The card explained, “As part of Saleforce’s commitment to equality for all, Dreamforce welcomes Trailblazers of all gender identities.” The card, as well as various other communications I had seen before and throughout the conference, informed attendees that there were “all gender restrooms” in one of the main conference centers. I don’t think I can adequately explain how this display of inclusivity made me feel, particularly because I hadn’t even been expecting it. I felt seen and welcomed, like I would be able to bring most of my whole self to this conference. My existence as a genderqueer person was validated by the restroom signs and this 4×6 card and button. I immediately chose the “Ask Me” sticker, and proudly fastened the button to my lanyard, front and center, just above my badge. I wasn’t sure what I would say when someone asked me, but I was hoping that someone would. In fact, three someones asked me. The first person was excited to meet an attendee with an “Ask Me” sticker and asked me: “What is your gender?” Prepared to get questions about pronouns, I wasn’t expecting to be asked outright about my gender identity.That’s a pretty complicated question for me to answer, and not exactly one I was prepared to discuss with a complete stranger. Caught off-guard, I awkwardly mumbled that I identify as genderqueer, and that my pronouns are she/her and/or they/them. She then proudly showed me her button, which displayed the “She/Her” sticker, and pointed out that she had written “unicorn” underneath it, which, apparently, was the gender she identifies with. I felt like her saying her gender is “unicorn” completely undermined, invalidated, and dismissed the real struggle that gender variant individuals experience in our lives. She may have thought she was being cute, but I thought she was being quite insensitive. On Thursday, the second-to-last day of the conference, I was asked again. This second person seemed a bit less well-intentioned than the unicorn. After a Salesforce staff member scanned my badge (which had occurred innumerable times by that point), she pointed to my button and said, “Ask you what?” and then laughed. I left that encounter confused, feeling like my gender or pronouns were something that could be made into a joke, or laughed off because someone didn’t understand or it made them uncomfortable. That encounter made me wish I had never worn the button at all. I debated about whether to remove the button for the last day of the conference. I didn’t know if I could handle another awkward encounter. I decided to leave it on in the hope that I’d have a positive experience (and even if no one asked me, I’d view that as a win at that point). Thankfully, I finally had the experience I had been hoping for. After introducing myself to Mary, the curator of the last session I attended, she saw my button, and asked, “What are your pronouns?” I thanked her for asking, and told her. After a brief, respectful, conversation about how I use both “she/her” and “they/them,” Mary revealed that the pronoun buttons were her idea. She was very interested in hearing feedback about my experiences, which she would use to inform the use and introduction of the buttons at future events. When Mary took the time to respectfully ask me about my pronouns, I felt seen, just as I had when I saw the button for the first time. Any time someone makes an effort to not make assumptions about my gender, I feel like I have a place in the same world that cisgender individuals do. When I’m met with ridicule (whether intended or not), it makes me feel like a joke. A better response would be to simply ask what pronouns a person uses, and if you do not understand how to use them properly, ask. Asking is always better than laughing or being dismissive. Faux pas like my first two encounters don’t have to occur. There is more that organizations like Salesforce — and organizations in the education sector like Bellwether — can do to ensure equity and be fully inclusive of gender variant people, and others who have diverse backgrounds, experiences, and social locations. 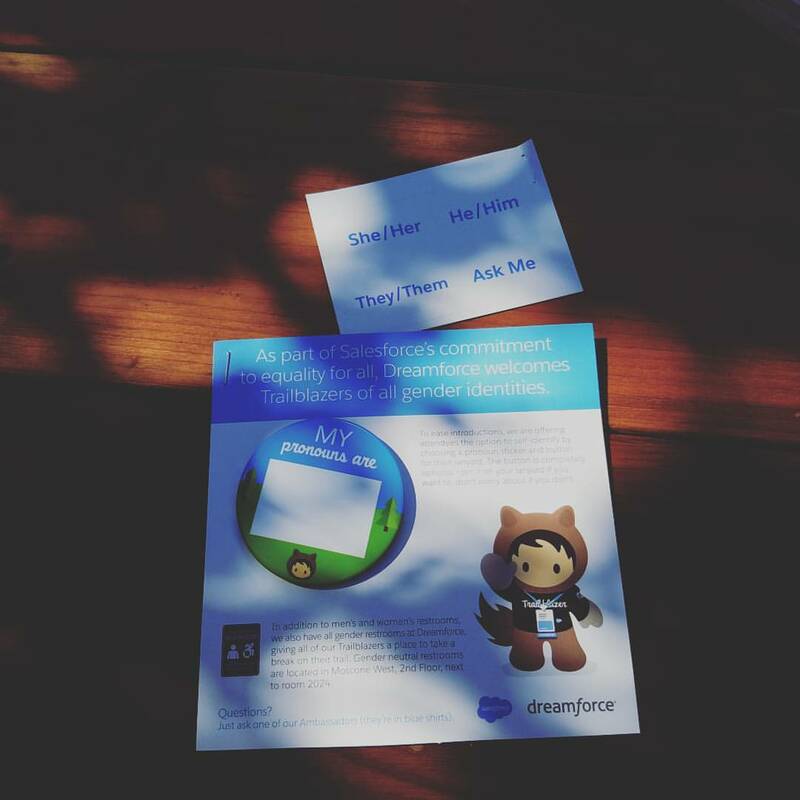 In fact, one piece of feedback Mary from Salesforce had already received about the buttons when I spoke with her was that only some of the volunteers or employees at Dreamforce received buttons, much less wore them. * In order to create a diverse and inclusive culture in an organization, its leadership has to be on board just as much as its employees. You have to walk the walk, as they say. This entire experience reminded me of Bellwether Talent Advising Partner, Xiomara Padamsee’s blog post about what is necessary beyond diversity. She writes that it’s important to help “organizational leaders to build and run educational equity organizations that […] live and act in deep alignment with beliefs around diversity, equity, and inclusion.” While pronoun buttons do indicate an increased awareness of the issue of gender variance, the buttons themselves without any kind of follow-through on an organizational level is not enough, and only allows people to ignore that anything outside the gender binary exists. More needs to be done to move that progress forward. Diversity and inclusion is a two-way (or in some cases, multi-way) street. It is just as important for an organization to make diversity, equity, and inclusion part of its culture, as it is to ensure its employees on an individual level are prepared to have respectful, meaningful conversations, or are able to at least facilitate some kind of discussion around challenging and potentially uncomfortable topics. True progress is gradual; it doesn’t happen overnight. 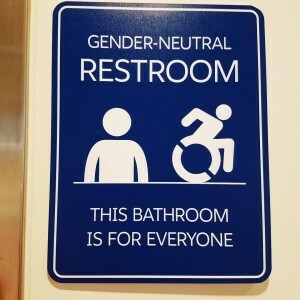 Having buttons with pronouns and gender neutral restrooms is absolutely a step in the right direction. Continuing the conversation and determining actionable steps for how an organization can best support its employees in a more meaningful way (like Salesforce.com employees themselves modeling the use of the pronoun buttons) is a surefire way to accelerate that progress. I’m looking forward to seeing what Dreamforce ‘17 brings. *This line was edited following a brief conversation with Mary after publishing. Author originally stated that none of the volunteers or employees received or wore the buttons. This entry was posted in Equity and tagged Diversity, Dreamforce16, gender, Inclusion, LGBTQ, talent advising on October 11, 2016 by Danielle Aguayo-Ceribo.